We usually 'multitask' in our browsers, right? So - except that you're reading this (or even going to post a reply all of a sudden) - what's the deal? Moderating, obviously. Hey, you asked. Posting in your thread, obviously. Shopping for an ebook. I think I've got twenty I haven't read, but I"m still acquiring more. Headaching at some open education podcasts on Oxford University's site. There's one called "Botanic Garden" -- I was indeed expecting some video - at least for an introduction... Know what? Only audio there - nice. 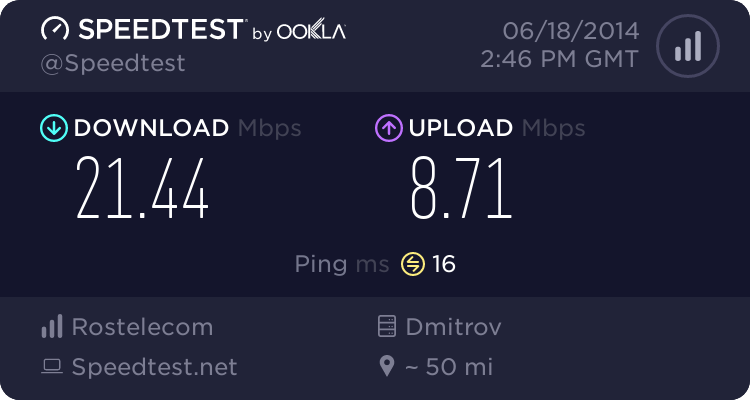 Checking 'image' sharing of Ookla speed testing results: . The previous time I tried I was with Opera (something was not right with the image (link)). Rainspa, I can't see any video. I wonder why, I can. I thought just the url would show but it's the video I see. Anyway it's Gemma Ray - 100MPH (in 2nd Gear) uploaded by Bronze Rat Records. You can address me just like this: "Josh, ...". Had you tried using the quotation tool here? In any case you can copypaste stuff putting it after "> " in the beginning of a new line. What browser are you with? Maybe there are differences? I tend to forget the quotation thingy on this forum ever since it changed from My Opera, I'm sure I'll adapt...eventually. Opera 12.17, but it's the same with Firefox in my case. Could it be a regional thing that stops it showing? Rain, I can see and watch your video in Opera. Just watched Countryman, however in bad quality (picture). The final titles are genial! What? Haven't heard? Me hadn't either, before. Happened to it via BBC Cambridge's "listen online" link. It seems that it doesn't have a core url - or sorts... Does it? Couldn't find any home link yet. Original 106 FM's now been playing - since yesterday late night. Quite stable a thing! Another - indigenous - player seems to have hung my Opera the night before. Another - indigenous - player seems to have hung my Opera the night before. I guess it could be a combination of such a player and a connection fall. My new connection has a bad habit to get lost once a day. IDK. BBC Cambridge is accessed via BBC Radio iplayer which isn't available outside UK, no link as far as I know, I think that's the case with all local radio. Radio Cambridge hosts Naked Scientists which I mentioned earlier as it happens. Radioplayer is partially funded by BBC and commercial radio I believe. Listening to (to say - "listening" - right) URB via UKradioplayer (a usual tab, Opera); having two active(!) tabs in the side panel (a clock and a thermometer).